"Republic of Outsiders" is about the growing number of Americans who disrupt the status quo: outsiders who seek to redefine a wide variety of fields, from film and mental health to diplomacy and music, from how we see gender to what we eat. They include professional and amateur filmmakers crowd-sourcing their work, transgender and autistic activists, and Occupy Wall StreetOCOs ?alternative bankers.OCO These people create and package new identities in a practice cultural critic Alissa Quart dubs ?identity innovationOCO: they push the boundaries of who they can be and what they can do, even turning the forces of co-optation to their benefit. In a brilliant and far-reaching account, Quart introduces us to individuals who have created new structures to keep themselves sane, fulfilled, and, on occasion, paid. This deeply reported book shows how and why these groups now gather, organize, and create new communities and economies. Without a middleman, freed of established media, and highly mobile, unusual ideas and cultures are able to spread more quickly and find audiences and allies. 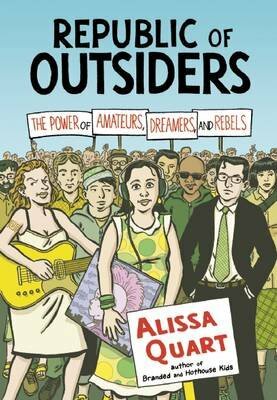 "Republic of Outsiders" is a critical examination of those for whom being rebellious, marginal, or amateur is a source of strength rather than weakness.